Bob Harold and Liz Harold King. 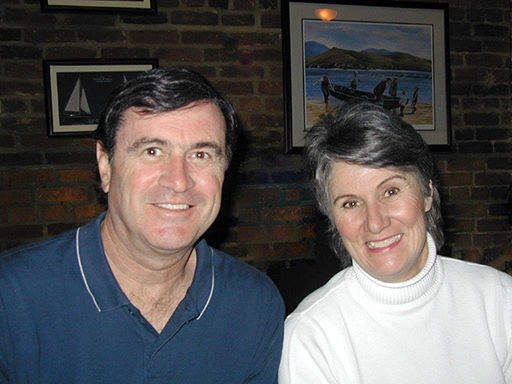 After raising her children, Liz spent 30 years working in law offices, the last 15 in the political realm of Washington D.C. She and her husband, Ron Coffman, make their home in Annapolis, MD. The Harold family has a long history with the Sisters of the Holy Names. Robert and Frances Harold and their children Liz, Bob and Jim made their home in Pasadena, CA. The children were taught by the Sisters at Saints Felicitas and Perpetua School in San Marino during the 1950s and 60s. “I was a very shy child and was in awe of the Sisters in those early years. They produced such amazing things from those pockets of theirs,” says Liz. Sister Mary Claudine Peacock taught Liz in the eighth grade. “She was tough on us, preparing us for the high school days ahead. As a result, I was always trying to avoid her. But to my horror, my mother and S. Mary Claudine became fast friends. Mom’s volunteer work on Hot Dog Thursdays just exacerbated the problem.” Liz believes that this deep friendship later motivated her mother to convert to Catholicism. 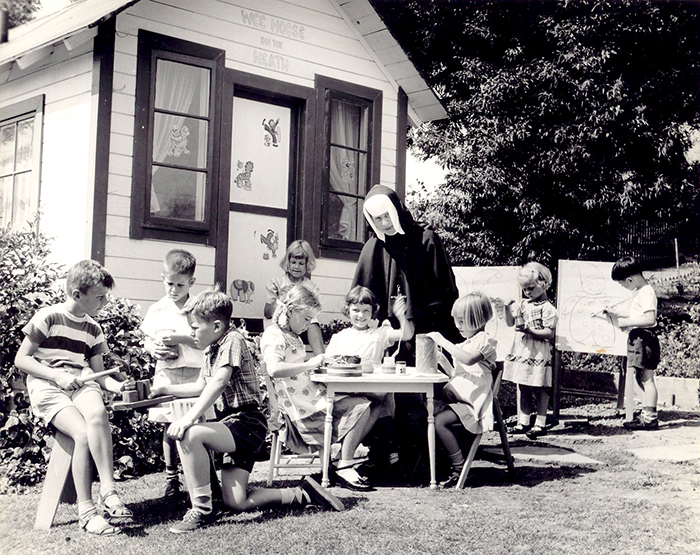 Bob Harold (on the far right) loved Sister Gabriel, who would drive a bus and pick up preschoolers for the Sisters’ summer Garden School. When Bob moved to Portland, Oregon, he rekindled his relationship with the Sisters at St. Mary’s Academy, where he has served as an advisor and board member for more than 27 years.